In contrast to Takakkaw Falls, which people admire for its height, Natural Bridge on the Kicking Horse River in British Columbia’s Yoho National Park impresses with its broadness. It also impresses with something else: the unusual rocks that underlie and surround the falls. Those rocks look to me as if they formed in horizontal layers that later got turned mostly vertical. For the sake of my photographs I walked out onto the upturned layers in several places, moving carefully to keep from slipping on and onto the rough edges around me. The photograph below reveals the natural bridge that gives the waterfall its name. The picture also shows the force with which the water gushes out from under that natural bridge. Pure beauty! I can hear the gushing waters! You’re right that the water going over the falls is loud. I hope someday you’ll get to hear in more than your imagination. Those edges that appear rough and doable to hop across can surely be slick! I think the lure of the sound of rushing water is why I love hiking in the mountains so much. I have a real appreciation for the power it holds. 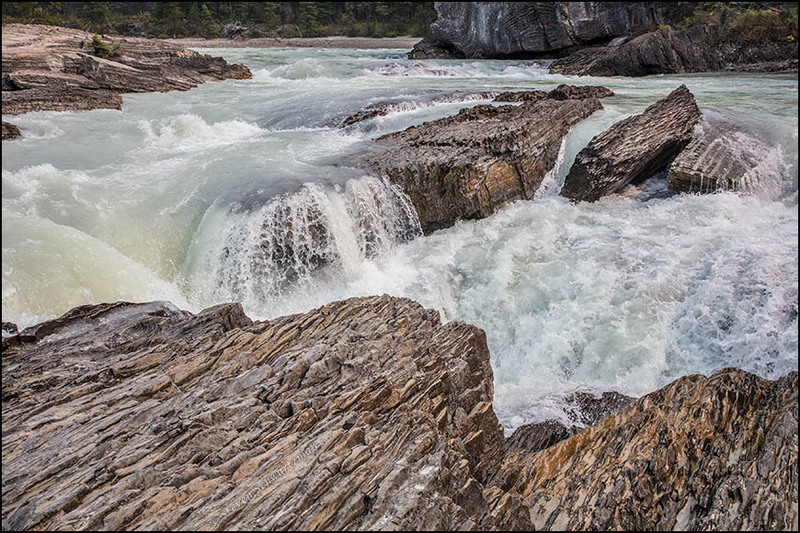 More power to you: you’d love hiking in the Canadian Rockies, where waterfalls abound. The same for New Zealand. Both have lured me this year. I found that edges like the ones shown here weren’t the only surfaces I had to be careful on. Even some broad and seemingly innocuous stones have gotten so smooth from the crowds of people walking on them over decades of ever-increasing tourism that those stones have become deceptively slippery. Maybe I should have breakfast. The flaky rocks in the first photo, especially in the upper left, remind me of a good puff pastry. On the other hand, the smooth, curvy rocks in the center of the second photo are an interesting contrast. I assume that’s a result of erosion from water that goes over the bridge as well as under it from time to time. Your comment about walking out onto the rocks reminded me of a conversation Judy Lovell and I had recently about the stories underlying our images. As you know, it’s not always as simple as “see flower, photograph flower.” My recent photo of the dew drop hanging from a bud came after I stepped into a hidden, two-foot deep hole beneath the grass. Somehow, I realized that grabbing the only thing at hand to steady myself — the shrub that was home to that bud — would have knocked off the droplet. So, it was up with the camera and down with me. Those sorts of experiences aren’t necessary for presenting the final image, but they’re certainly part of what makes the process of photography so pleasurable.They evoke entire experiences, and are like little secrets behind the image. At least, that’s how it seems to me. I’m with you in valuing the stories behind the images. A longstanding debate in the humanities asks whether a work of art should stand entirely on its own, or whether the work is enhanced when the viewer/reader/listener knows things about the creator and the circumstances that led to the work’s creation. I’ve always been inclined to want to know the behind-the-scenes details. As for blogs, I’ve come across a few that regularly present photographs without comment, but much more commonly I’ve found that bloggers supply background information. When I look at a picture of mine, even from decades ago, I usually remember the specific location and various details about the experience. I should add that as a teacher I’m inclinded, sometimes almost impelled, to provide background information. Of course the causality might run the other way: my desire for information could have drawn me to teaching. When I’ve visited faraway places I’ve often regretted not being able to see them in other seasons. The Canadian Rockies are so different in winter than in summer, when I saw them. I don’t tolerate cold well, but I’d gladly put up with short spells of it to see your Rocky Mountain world in winter. Perhaps one of these days. I took the precaution of bringing a sweater and light jacket to Alberta, thinking it might get cool in the mountains. The weather turned out to be so warm I never wore the sweater and only once or twice even put on the light jacket. That said, I know how could it might have gotten if we’d been at a higher altitude in mid-September. In fact I heard it snowed in the mountains on the night before we left on September 14th. I like the perspectives in both pictures. Glad to hear it. I often photograph a scene in both horizontal and vertical orientations (and occasionally even on a slant). While I find the first photograph artistically satisfying, I felt the need to include the second to explain the name Natural Bridge. Absolutely fantastic! What a shot! What a beauty! Yes, it’s a great place. I hope you get to see it in person.